Well I am sure that you will have heard of John Green, its hard to escape him when The Fault in our Stars seems to be dominating both the book and film world. I fell head over heels in love with TFIOS, I love a book that can make you cry and with this offering I shed bucketfuls! I was a bit sceptical starting Looking For Alaska because I just couldn't imagine how it could live up to my high expectations. Sadly it didn't, it's not that it wasn't good, I really did enjoy it, I just felt that there were moments where it didn't quite reach my high expectations for a John Green book. I felt that characters were alright but not amazing and for me the story line just fell a bit flat. The book follows the life of Miles aka Pudge who dreams of living the adventurous life of a boarding school pupil. He befriends Chip (The Colonel) and Alaska and they embark on a life of pulling pranks, smoking cigarettes *insert John Green metaphor*, and drinking cheap alcohol whilst trying to avoid the wrath of their headmaster. I really enjoyed the first half of the book as Pudge found his feet and finally found the friends he had dreamt of. I found that as teens the characters were realistic and I found them fascinating and annoying in equal measure. Where I found it fell short of my expectation was the second half of the book, for me it didn't quite hit the mark and when I finished it I felt as though I had been robbed of a good ending. I would just like to add here that I know so many people who preferred Looking For Alaska to TFIOS and this is just my own opinion and I am sure that many people will read it and find it to be absolute John Green perfection. What I find amazing about John Green is that he writes teen fiction so well that I almost forget that he is a middle aged man with two kids and a wife. To me John Green is the perfect example that you don't have to be a teen to be able to write or appreciate young adult fiction. Looking for Alaska was beautifully written, the compulsory John Green metaphors and good humour dominated the book, making serious situations understandable and relatable. I can't criticize the writing style as John Green got that absolutely right, for me the story line just wasn't strong enough. 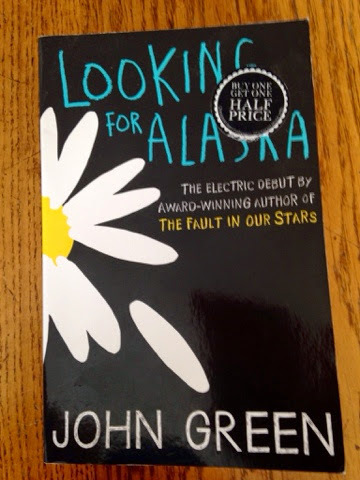 Let me know in a comment what you thought of Looking For Alaska if you have read it! I love John Greens books. I actually listened to the Audiobook of Looking For Alaska which I actually preferred. I felt the narrator really bought the book to the life with accents and impersonations of the characters. Maybe if I was to actually read it I may of felt differently. I love John Green, TFIOS was amazing and I did enjoy 'Looking For Alaska', I just thought that the start was so strong that the end didn't quite live up to it! I completely understand what you mean about listening to it on audiobook though, I can imagine it really brings the characters to life- I might have to give it a go!